We are so convinced that these are the best midranges on the market that we will give you a 90 day money back guarantee on these. Try them for 90 days. If you don't love them, then we will send a call tag for them and we will cover all return shipping costs and give you your money back in full. Rockville is committed to manufacturing products that represent "professional sound" and the RM Pro Series is no exception. Rockville engineers utilized the latest in Pro Audio technology and transferred it to these car audio midranges so that you will achieve stadium quality sound in your vehicle along with serious power handling. The RM Pro series is the step up high-end series of mids by Rockville. This 6" midrange/midbass driver features CEA rated 200 watts peak power and 100 watts RMS. Power these with an external amp for mind-blowing presence. The bonus of being a combination driver is the music still retains clear, crisp vocals without losing the lows of a song. You will be amazed at the definition, frequency response, and super high SPL that these speakers produce. Rockville RM64PRO 6.5" Open Basket Midrange Speaker. Power Rating: Peak: 200 Watts/RMS: 100 Watts. CEA Compliant Power Ratings. Kevlar Reinforced Black Pulp Cone. Treated Cloth Accordion Suspension. Linear Progressive Conex Spider. Kevlar Reinforced Pulp Paper Dustcap. High Tensile Expanded Steel Basket. Oversize 1.5" High Temperature CCAR Voice Coil. 90oz. Magnet Structure Weight . Impedance: 4-Ohm. Mounting Depth: 3.07". Frequency Response: 85Hz - 7 KHz. Sensitivity: 103dB @ 1w / 1m. Cutout diameter: 5.79". Mounting diameter: 6.16". Mounting hole diameter: 4 holes- 0.217" x 0.276". TS Parameters:. REVC: 3.120 Ohm. FO: 128.715 Hz. SD: 13.893m M. MD: 14.300 . BL: 6.620 T. QMS: 3.299. QES: 0.586. QTS: 0.498. NO: 1.448 %. SPL: 103 dB. VAS: 4.116m M. CMS: 150.160u M/N. KRM: 3.090m Ohm. ERM: 0.715. MMS: 10.182 g. MMD: 9.240m Kg. KXM: 11.734m H. EXM: 0.591 . 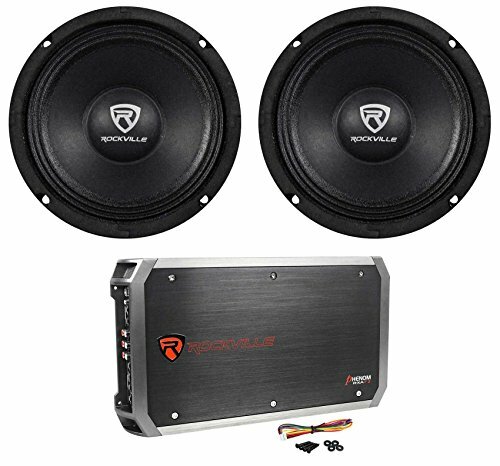 Rockville RXA-F2 2400 Watt Peak / 1200w RMS 4 Channel Car Stereo Amplifier . CEA Compliant Power Ratings: . 400 Watts (4 x 100 Watts) at 4 ohms and 1% THD+N . 600 Watts (4 x 150 Watts) at 2 ohms < 1% THD. 600 Watts (2 x 300 Watts) bridged @ 4 Ohms < 1% THD. RMS Power Ratings . 1200 Watts (4 x 300 Watts RMS) @ 2 ohms . 1200 Watts (2 x 600 Watts RMS) @ 4 ohm Bridged . 800 Watts (4 x 200 Watts RMS) @ 4 ohms. Peak Power: 2400 Watts (2 x 1200 @ 2 ohms or 1 x 2400 @ 4 Ohms). High-Speed MOSFET Power Supply. Studio-Grade Bipolar Output Stage Transistors. Crossover Band-Pass Control . Fully Adjustable 12dB Bass Equalizer. 2-Ohm Stable Stereo. 4-Ohm Mono Bridgeable. 3 Channel Mixed-Mono Capable. Studio-Grade Bipolar Output Stage Transistors. Mute and Delay Soft Start System. Full IC-Controlled Protection Circuitry. 2 CH / 4 CH Input Mode Switch.